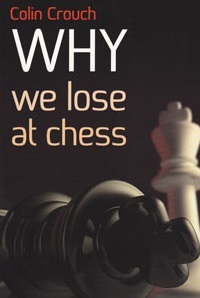 Why We Lose at Chess. Type: BOOKS. Detail: Crouch, C. Product Code: 9781857446364. This is a very interesting book. Following a stroke which put IM Crouch temporarily out of competitive chess action, he spent some time during the 2006 and 2007 period working on his own games. The resulting analysis forms the basis of this volume.He presents the material in the form of 15 tests, each one featuring four game positions. The reader is given three options from which to chose the best continuation.The positions are then given in the context of an annotated game, with special emphasis given to when and how potentially losing mistakes occur.IM Crouch nicely verbalises his thoughts and searches deeply for the reasons behind mistakes. There's also some advice on the general thinking process which goes into selection moves over the board.The author is very open and honest about the effects of the stroke he suffered a few years ago, leaving him blind in one eye and somewhat less than 100% in the other. Indeed, in the build up to the stroke he lost around 100 ELO and wondered why; the answer was worse news than a sticking with a dubious opening or two.